The translation from Dutch can be found in the Press Archives. I can’t wait for the TV Spot and the printed ads! Vote for Eva as the “London Frenchie of the Year 2007″: http://www.grandes-ecoles-city-circle.com/vote2007.htm –> Ms Green needs your votes. Marc Levy admirors are also voting a lot. The election is about to end! How do you vote if you don’t understand any French? Click on Eva’s pic among the 4 nominees on the left side of your screen. A bigger image of Eva will appear. Then click on the “Vote!” button which is located at the top on the right. Your vote isn’t complete until you see the following message on your screen: “Merci! Ton vote a bien été enregistré!”. 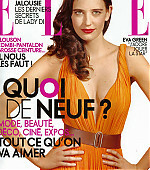 Our beautiful Eva is gracing the cover and the pages of this week’s issue of Elle France! The photo used on the cover isn’t new, but the ones inside are!!! She looks gorgeous and sophisticated!!! There’s also a brand new interview that you can read here (it’s in French). 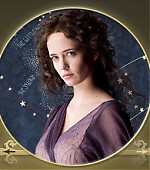 Eva Green, the sweet enchanteress! 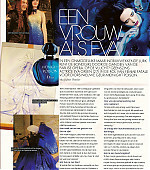 There’s a new interview with Eva about her beauty secrets in the British magazine Grazia. Many thanks to Charlotte for sending a scan! Thanks to Paolo, we now have scans from today’s issue of Io Donna. The photos aren’t new but it doesn’t matter because I’m always happy to see Eva in magazines and I think that so are you. The article is somewhat new. It’s about all the things that she discussed at Cannes. First of all, thanks to Anouk for sending in 4 new Serafina stills. Last but not least, we have a brand new video thanks to the awesome Isabelle. 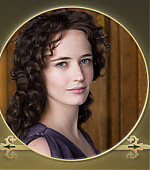 It’s a French interview (that also contains on-set footage) in which Eva talks about “The Golden Compass” and her international career. She said that unfortunately she didn’t find any new French roles that she liked so far. She also said that she had to rehearse a lot, suspended on the air, very high, and that it was a problem because she’s very scared of heights but that she lands very well now. Screen captures from it can be found in the gallery. I translated from French an excerpt of an interview with Marlène Jobert in which she talks about her twins, Eva and Joy. Thanks to Emma, we have a new (old) video from the Journal de France 2. It’s a special feature on Casino Royale with short interviews with Daniel Craig, Caterina Murino and Eva Green. Like in many other CR promotional interviews, the two Bond girls were asked how it was to kiss James Bond. Eva replied that they are both actors, that they are both very professional, that everybody can do that and that kissing Bond was the least of things. Our girl was also asked what was her favorite filming location and she answered Lake Como. # Eva Green and Louis Garrel will both be present at the Festival Futuro Presente this Friday. The Italian festival is honoring Bernardo Bertolucci this year. # About 15 minutes of footage will be shown at the Cannes Film Festival, which kicks off May 16. That’s the same buzz-generating strategy used for 2001’s Fellowship of the Ring. Dakota Blue Richards is expected to attend the festival, along with writer/director Chris Weitz (About a Boy) and co-stars Daniel Craig, Sam Elliott and Eva Green. But Nicole Kidman, who plays the mysterious Mrs. Coulter, will be busy shooting another film. # The first teaser trailer will set sail May 25, along with Pirates of the Caribbean: At World’s End.